According to Audrey Mae’s artistic cemetery map diagram and Audrey Mae’s gravestone numbering system, Susan Caroline’s gravestone is Gravestone Number Twenty-Two. Using her Smith-Corona typewriter in the 1980s, Audrey Mae typed the following mini-biography of Susan Caroline, a seventh-generation Spencer in East Greenwich, Rhode Island. Susan Caroline and four of her sisters died at such young ages. 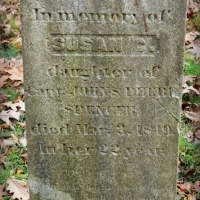 Audrey Mae did not record the causes of their deaths but noted that their Spencer grandparents died at age 70 and age 89 and their own parents died at age 54 and 74. As Audrey Mae died in 2007, Web author is unable to ask Audrey Mae what is meant by her comment on Obediah’s (gravestone No. 21) mini-biography about poisoning 1st mate on Bach Susan. Does that statement refer to this Susan? More research is needed. 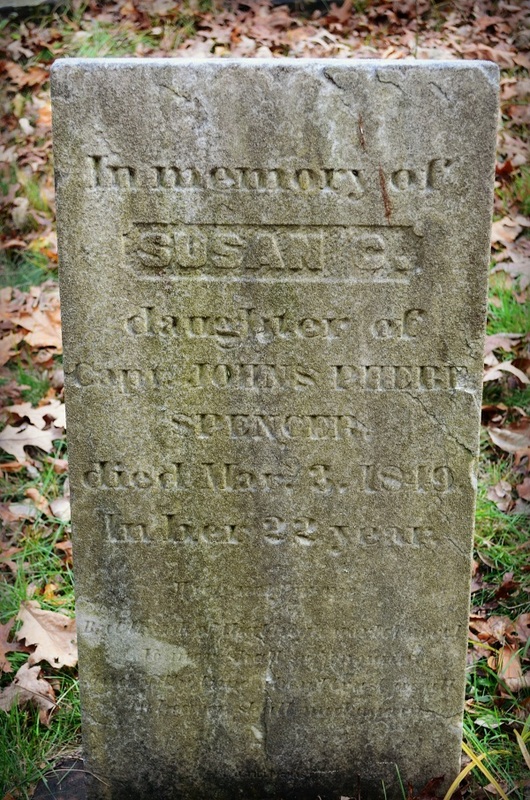 This entry was posted in All Gravestones, Born into the Spencer line, on December 20, 2012 by Heather.